Welcome to part 7 of TVTA’s series Never Mind The Adverts. 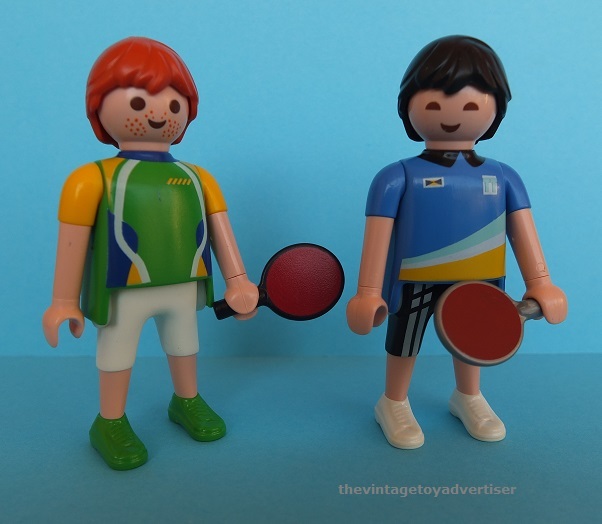 In this edition we focus on vintage and modern Playmobil figures. 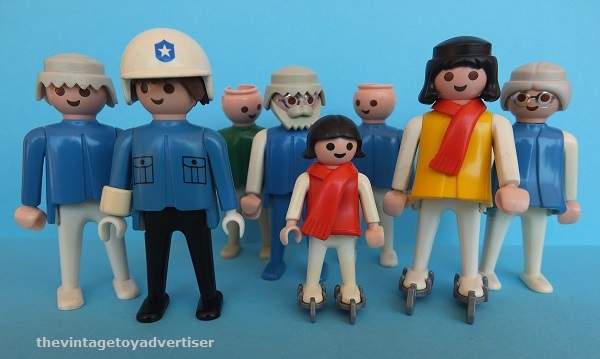 Playmobil is one of my favourite toy lines for its simplicity, feel-good factor and traditional themes. 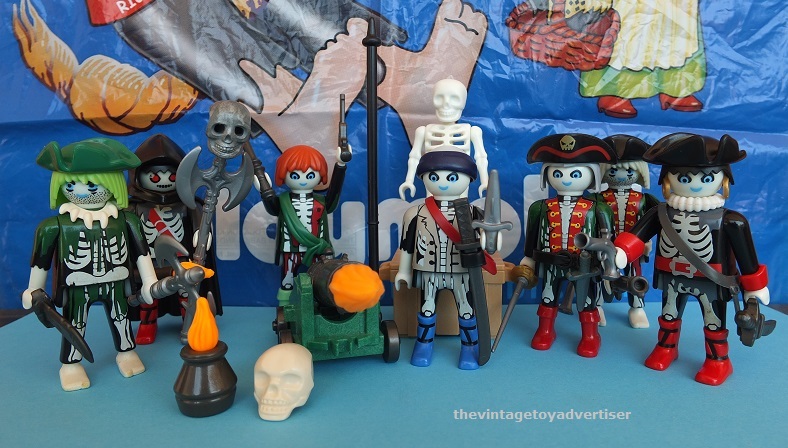 As an archiver of toy advertising and a bit of a junkie when it comes to collecting toys, it’s always fun to add some Playmobil, whether from the secondary market, new, or by nagging the family to dig out any childhood stuff. Some of the following sets below are incomplete, but will still, I’m sure, have the power to bring a smile to your face. 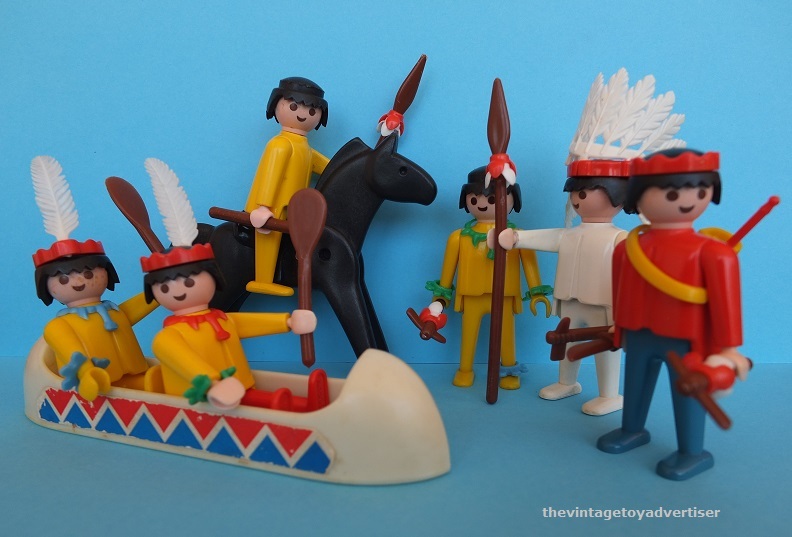 Various figures and accessories from vintage Playmobil indian sets. Circus bands. 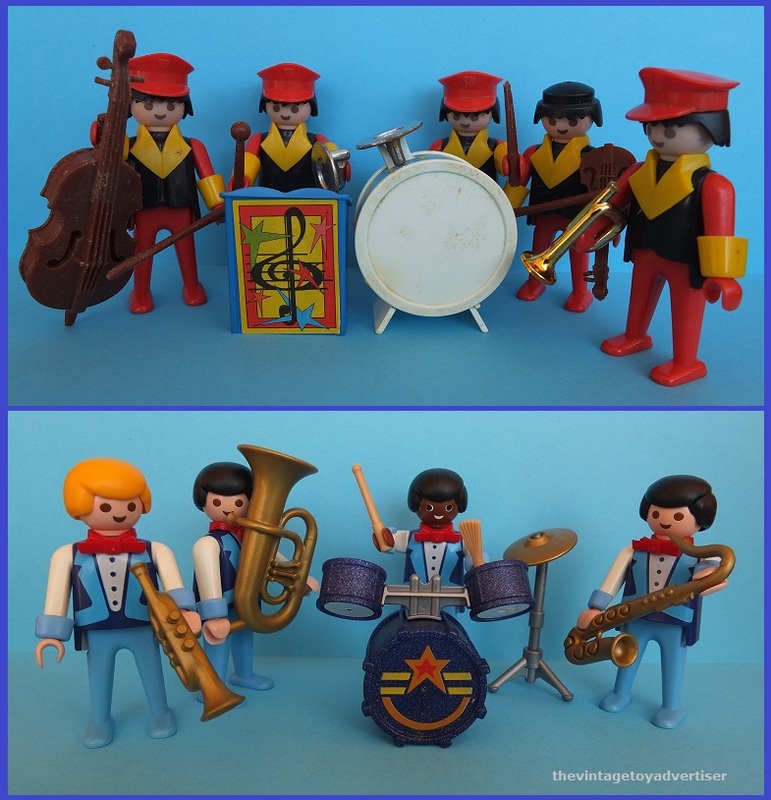 The top is a vintage set from the mid 1970s missing a few pieces, while the bottom is from circa 1991 and is missing the stage and a cymbal stand. I was pleased with how this photo turned out. 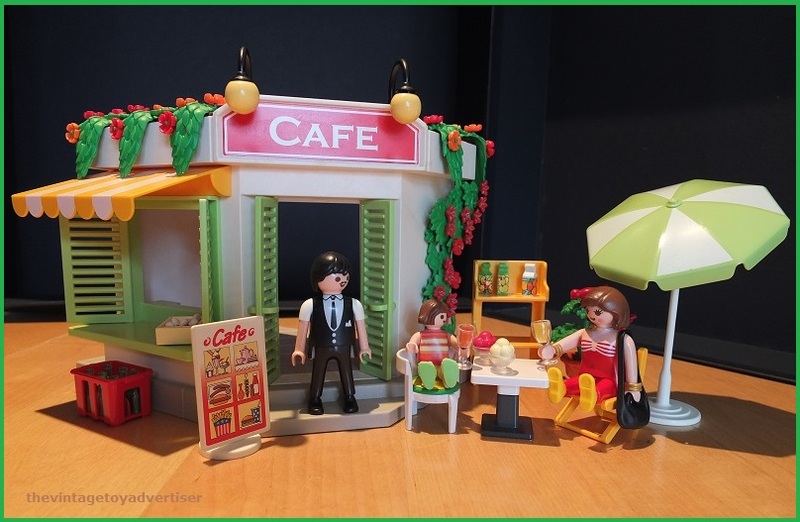 This set was available in France as a mail away order in the Playmobil catalogue supplement. 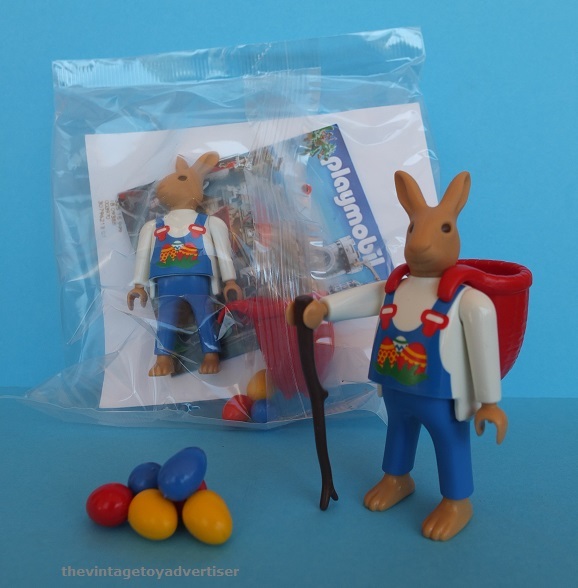 Playmobil Easter bunny with eggs, basket and cane. Loose and packaged example. This strange but cute figure was given away in meals by French fast-food chain Quick in 2016. 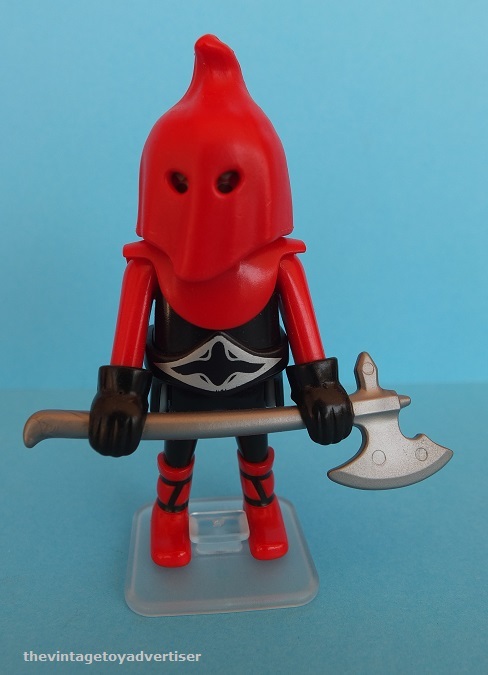 It has the feet and head of a rabbit appearing on the body of a Playmobil figure. 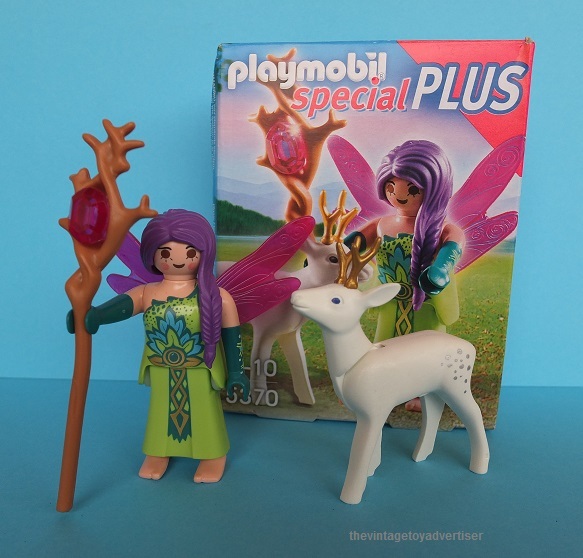 The character is the same as the one sold in 2014 in the Playmobil Easter calendar pack. 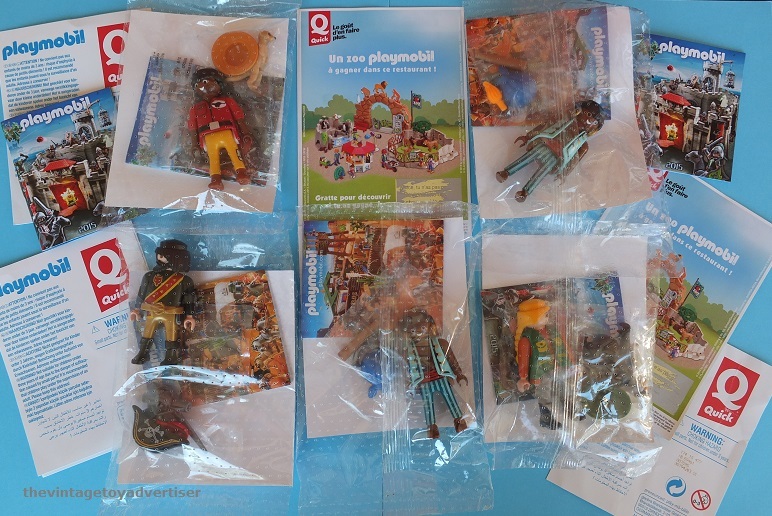 Playmo Easter bunnies can be dated back to 2004. Sealed baggies. Quick promo figures from 2014 / 2015. Brazil. 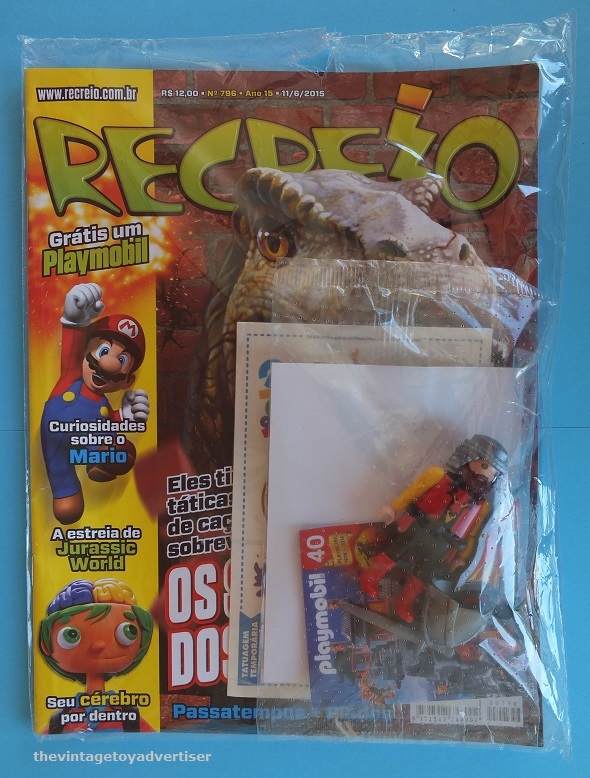 Sealed Recreio comic with Playmobil promotional figure in baggie. 2015. E-Rangers Robot and driver. 2012. This very cool toy has articulated arms, legs and feet, and can grasp objects. It comes with a crate of red rocks for lifting (not pictured). 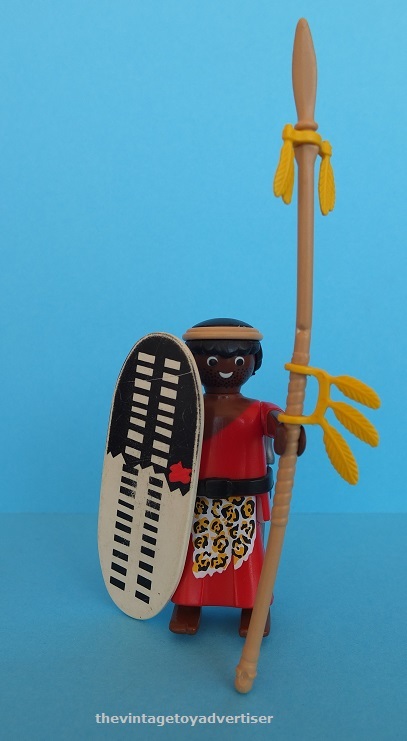 From Playmobil’s ‘Fi?ures’ collection. 2011. 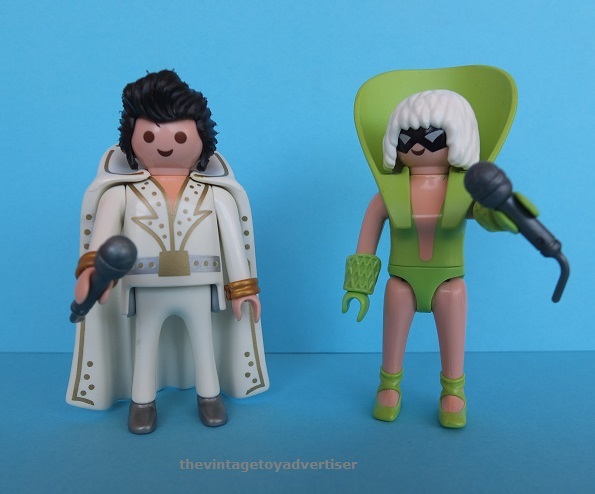 Series 2 Elvis and Series 3 Lady Gaga. 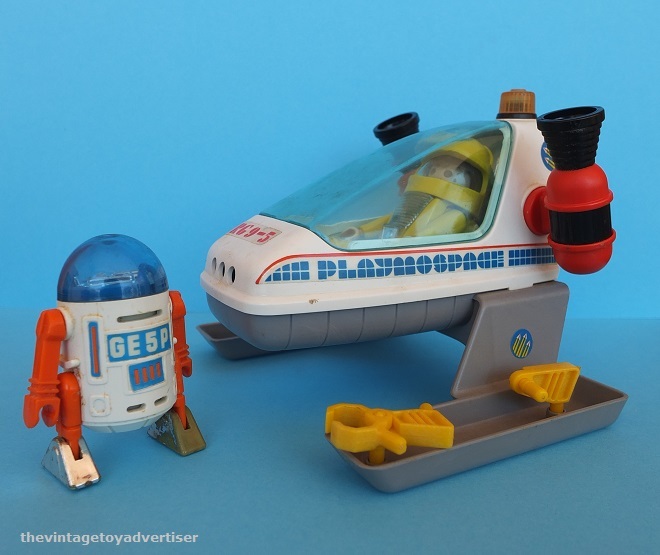 Vintage Playmo-space. 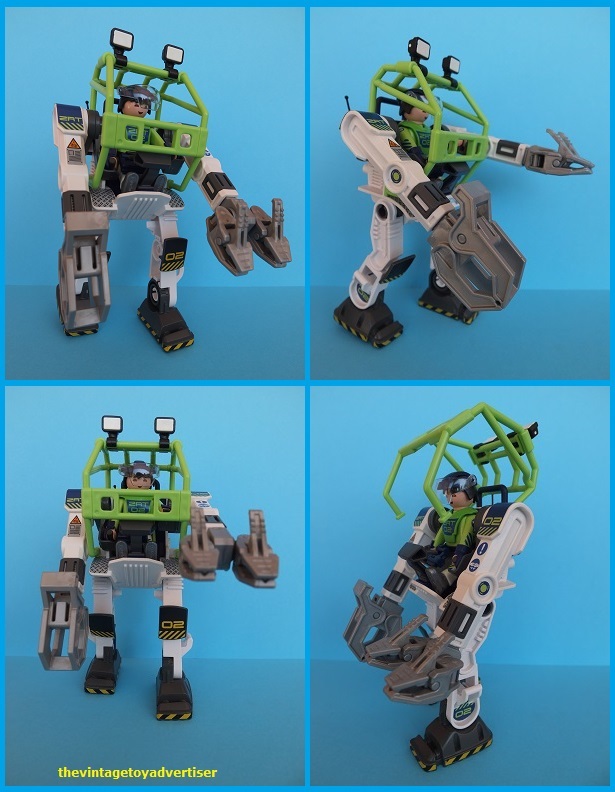 GE 5P robot with RG 9-5 vehicle and figure. Circa 1980. 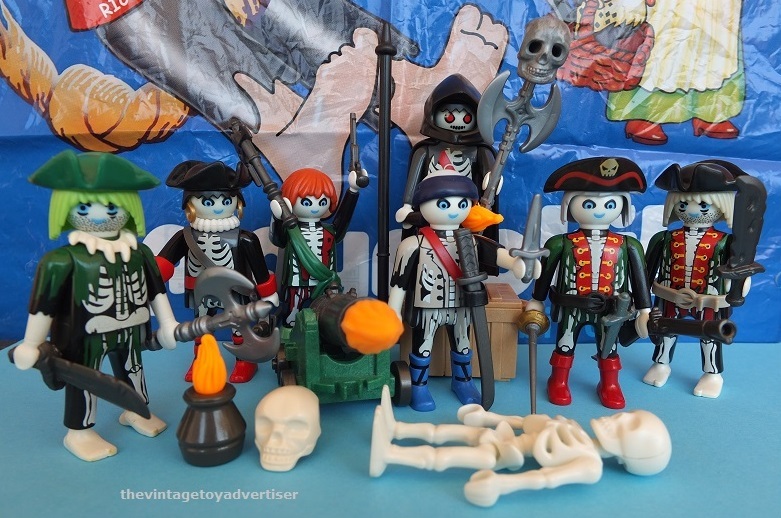 From the Playmobil Special Plus collection. Fairy and deer. 2016. This particular set was given away free by French company Prince when you collected ten tokens from their biscuit products. 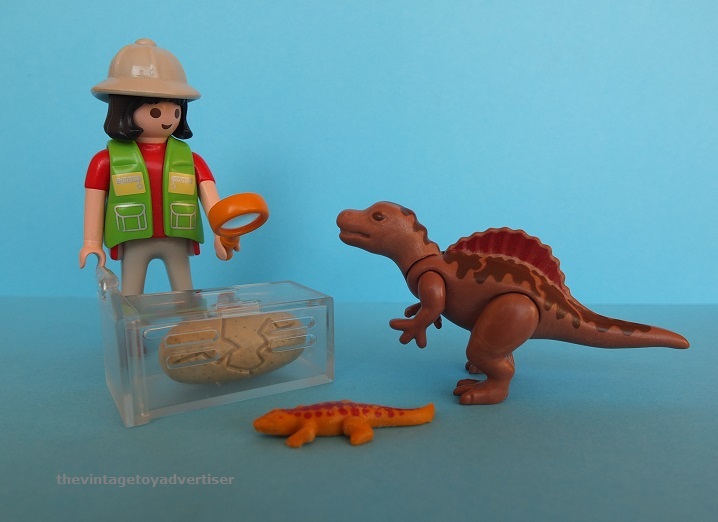 Baby dinosaur, dinosaur egg, scientist. Circa 2011. Table tennis players from 2011. I call these my “Zombie Pirates” but they’re really just various ghost pirates pulled together from sets between 2009 and 2012 to form an undead motley crew of ocean-bound vagabonds. That’s all for now. Thanks for looking, and join us again soon for another Never Mind The Adverts! Dates quoted from official Playmobil catalogues. This entry was posted in Never Mind The Adverts..., PLAYMOBIL and tagged Klicky, Never mind the adverts here are the toys, nostalgia, playmo space, Playmobil, Playmobil cafe, Playmobil circus bands, Playmobil E Rangers robot, Playmobil easter rabbit, Playmobil Elvis and Lady gaga, Playmobil figures, playmobil ghost pirates, Playmobil Prince biscuits offer, retro toys, vintage toys on April 10, 2017 by The Vintage Toy Advertiser.